Monday: First day off. Found some keys from work in my pocket so dropped them off. Went to see Ken Dodd with my mum. They said he would be on a long time but I didn’t think he would be on till 00.45 or quarter to one in the morning. 5 + hours in all, no wonder people left early. Tuesday: Had planned to do a spinning class but nobody was answering the phones. Thought I had kerbed the alloys on the Mini so it was off to Chester for some touch up paint. Had a go of Sport mode away from the lights and it flies. Wednesday: Had planned to go on Barry’s ride from the Seven Stars but the torrential rain put me off, they were still talking about the last one two weeks later. After waiting a couple of hours for rain to ease off it was time to hit Route 56. Had planned to call in at Wheelbase and put some air into the front tyre but he was closed today. I twas a bit grim at Seacombe with a headwind and a choppy Mersey. The only good thing was it meant a tailwind once you got to New Brighton. The new Floral Pavillion looked packed and then it dawned on me, all the cars coming down the other way were full of kids off to the panto. Went through the wind blown sand at Harrison Drive and then on to the sea defences. Here I eventually stopped as a gritty rubbing noise was getting on my nerves. It’ been like this for a while now and I hadn’t found out what it was. I’ve been bending the mudguard while on the move but it wasn’t having it. It turned ot to be the tab that is bolted to the brake caliper was too low and every bit of grit on the front tyre would catch it. The only downside of it is a silent bike means walkers and dog owners can’t hear you coming. The first stop was Morrisons in West Kirby for an afternoon tea which comprises of a cup of tea, half an egg sandwhich and a small scone. 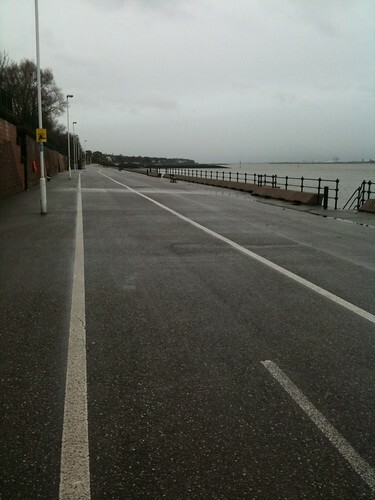 Booked some spinning classes on the way home and took to the Wirral Way. No tacks and some good views over to snowcapped Wales. Came off the Wirral Way at Lower Heswall and climbed Delavor Road. The Garmin 705 is throwing a wobbler with the Grade function showing a wobbler, it read everything but the correct gradient. If your going to get knocked off this is the place as it’s awash with Mercs and Range Rovers as against lads in uninsured Saxos that passed me on the Four Bridges. I’d booked a spinning class at West Kirby. Sweated buckets, burnt 748 caloriesand had the Heartrate up to 180 BPM another on booked for tommorow. Which will be the last of the year. Thursday: Last spinning class of the year which was full with 2 first timers. 743 calories for this one with the monitor freezing halfway through the class. Gym afterwards for weight machines an a 2 km row. Parked in Aldi on the way home as Tesco’s looked chaotic. Picked up the comic and took District 9 back to Blockbuster. Made some guys day in Marks an Spencer when I pointed out he was refunding me too much. Washed the car yet again and thats about it for the year. Work in the morning so it’s not such a good New Year. Friday: Hard frost on the Mini was sorted in about a minute, the side windows needed the credit card, even so it heats up really quickly and so it shoukd given all the boxes I ticked. Saturday: Bloody grim weather through Brimstage followed by an Ice rink through Liverpool. Guess it’s a case of the coucil not wanting to pay out for gritters on New Years Day. Happy New Year Frank. Just a note of thanks for the blog this year which has been a constant reference point for me. I feel that we have both been on a journey this year (though your’s was somewhat sadder than mine) and think we will come out of it all in 2010. Hi Frank Happy New Year! What an achievment I am using you as inspiration to do the same. I too gave up cycling 10 years ago and have gone from 12.7 to 20 stone. Health issues etc appeared and like you thought it was better than it was, denial… I was bordering diabetes and on medication for blood pressure. But I started cycling again 5 months ago and have lost 3.5 stone and gone from a 46 to 36 ” waist. Blood pressure is normal and no more pills. My resting heart rate has fallen from 88 to 55. I want to lose another 3.5 stone but it is a lot slower than it was,so my target is to lose another 2.5 for the summer and the last stone by year end. I was riding 20 miles every day but now its every other day and an hour on the gym on days between. So weight loss is a lot slower now but am gaining muscle as well. Did you have months where no weight loss occured? Keep up the routine and i respect your fantastic effort and bloody hard work you have put into it… all the best Steve. Happy New Year – keep up the good work it os multiplied many times over when you post! A very mixed year, the last couple of months have seen me putting on about 10 Kg which is a lot. I’ll put ut down to crap weather, work which wants it’s pound of flesh hour wise and a loss of will at times. Trying to figure out what to ride next year, it won’t be the Etape as I figure this is beyond me at the moment. Looking at going to the Tour and doing a few classic climbs. Providing I can get my weight back down to what it was.